How will I keep from getting fired? Work is boring. Not the work itself (hopefully), but the process of doing it tends to be repetitive. Plus, laptops have been pretty much the same for decades now (sorry Apple, Touch Bar isn't a thing people want). I've relied on a MacBook Pro for years. I've tried changing it up to something more fun, like an iPad Pro with an attachable keyboard for more portable working, but that setup just isn't good enough for my needs yet. Then my VR diary came along. What if I could use VR, the most immersive medium available, to help make work more tangible? I've already seen how it can help me create art, freeing my mind to work rather than get caught up in the tools I'm using to create. Why couldn't VR do that for regular work? Plus, this is an area we've seen companies push toward. Oculus has Core 2.0 beta, which allows you to use your PC desktop with Rift. But that's still in beta and, unfortunately, out of my grasp for this. So last week I decided to turn to Microsoft's Windows Mixed Reality to help see if I could virtually work a week here at Wareable – without getting fired. 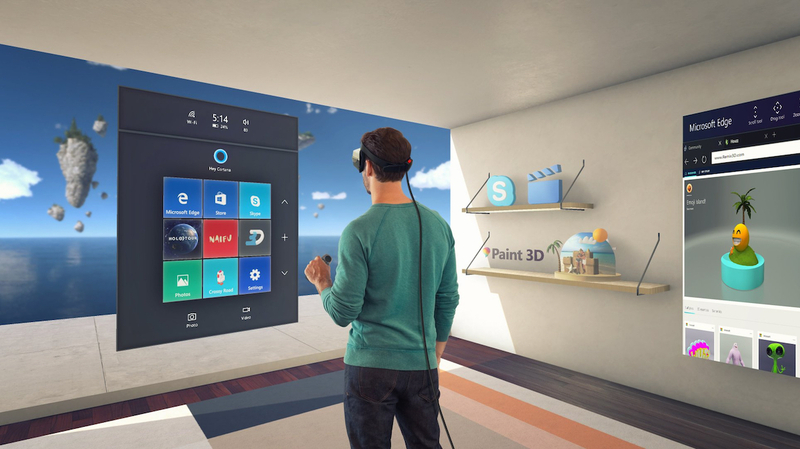 My goal was essentially to live in the Windows Mixed Reality's Cliff House, a scenic virtual environment that allows you to pull in software like Word and Excel. Spreadsheets have never been this immersive. There were a couple of promising advantages to being able to work in VR that I was excited about. For one, I'd be able to work anywhere. Windows Mixed Reality's Cliff House is set amongst a good-looking body of water with virtual trees. It's pleasant and calming, far more pleasant and calming than the bustling Wareable SF office, where dogs will bark and a neighbouring nightclub tests out its beats on the regular (no joke, we've felt the vibrations under our feet). I've always been a hands-on person. The best way for me to learn is to play with something, to touch it and get actual experience with it. I'm excited to see how VR can bridge that gap. For work, it could help me edit photos better, let me manipulate the words as if I was working on a tablet, dragging my finger across the air to correct mistakes. Or at least that was the idea. I was so ready. Even a little excited. But within the first minute, I hit a problem (this is going to be a recurring phrase). I'd booted up the PC, strapped on the Lenovo Explorer headset, popped open Slack and got ready to say my customary hello to the team, but I couldn't. I used the motion controller to click on the text-entry field, but nothing came up. I could see Conor and Mike chatting away, I could see myself online, but I couldn't say anything. It was like I was trapped in some sort of office-set nightmare – the worst kind of nightmare. I frantically clicked around hoping something would happen, but all that happened is my anxiety shot up and the minutes ticked by. A writer who couldn't write. How useful. If I'm using a mouse and a keyboard, why even use the headset? *Record scratch* You may be wondering how I got into this situation. Why not just use a keyboard? Well, I tried that and it turns out it's a weird half-measure that left me not wanting to be in VR at all. You get in your desktop environment, then you pull up a keyboard and type away. To move anything on the screen, you either need to go pick up a motion controller and poke at things or just use a mouse. If I'm using a mouse and a keyboard, why even use the headset? Especially since there's a perfectly good monitor right in front of me. I'm just weighing down my head with a monitor. It's the same reason a tablet for work just doesn't yet cut it. Plus, not using a keyboard is really what fulfills my mission statement of seeing whether VR can replace how I normally do things – and that's kind of the point of this, right? So I took off the headset and went back to the Mixed Reality Portal and played around. I clicked about, but there was nothing that could solve my predicament. Then I realized that Windows 10 has a tablet mode. Yes, I fully realised that after decrying tablets as not good enough for work I'd how be using a tablet mode for work. Switching Windows 10 to tablet mode brought up the keyboard with a consistency (read: every time I clicked on a text-entry field) I craved. Problem solved – except there was another problem: I couldn't see what I was actually typing. You know how smartphone keyboards either result in autocorrect bastardising your sentences or a garbled mess of letters that look like your cat did the flamenco on your keyboard? Typing in VR is like the latter of those two. I mean, I had to just bop the motion controllers in the air at this giant keyboard, which is about the actual size of a 17-inch laptop. I couldn't see a word I was typing, and to enter I had to click Enter sight unseen. If I wanted to see what I typed, I'd have to exit the keyboard and hope clicking on the text-entry field would let me change things (narrator: it didn't). Not only was I late for work, I also looked like I was drunk on the job. If that's not a one-way ticket to the unemployment line then I'm not sure what is. Regardless, after some awkward encounters and making it clear that I'm typing in VR and not under the influence of any substances, I was able to talk to my co-workers. About that. Communicating with co-workers in VR is actually worse than just using Slack with a keyboard. You can normally move fast and keep up with rapid conversations and banter. In VR, you're generally typing slower because the keyboard is the size of a desk. That means that everything would pass me by, which means I would be left out of what was happening, which means I felt like I was closed off from things. Alternatively you can use the Skype Windows Mixed Reality app for voice conversations. We usually have a team Skype call once per week, so for that it serves its purpose, but I wouldn't otherwise use it at work. What wasn't a problem was checking in on other people's work and editing, which was less painful than writing from scratch. Even editing and uploading pictures was pretty easy in VR. Granted, I'm talking simple stuff here, like making sure pictures are the right aspect ratio and fit in with Wareable's picture style. These menial tasks soon started to add up. The headset I was wearing started getting heavy. The sweat on my brow was getting noticeable. I needed a break. So after about an hour in the headset I took it off, and I immediately realised I had a splitting headache. I cracked open a window, I washed my face and just kind of mellowed out for about 30 minutes. I was nauseous. I was excited for VR to help block out the distractions of office work, but having to take breaks every once in a while for about half an hour added to the distractions. I thought about other things. I looked out the window and zoned out hoping the nausea would go away. I thought about how much Tylenol was too much Tylenol. I stood around in the kitchen pondering whether ginger ale might help ease the sickness. These aren't the distractions I'd typically get during work, like wanting to scroll through Twitter or Facebook or read an odd article here or there. These were distractions though, and they were long, drawn out distractions that made it hard to want to get back to actual work. Anyway, it turns out that when I set up my desktop, I hung it off a cliff and made it really, really big. I wanted it this way so that I could see everything, and I wouldn't have to squint and move my head around a lot. This actually worked pretty well, but it all started to fall apart when trying to scroll text and read at the same time. It felt like trying to read while in the car. You just want to puke. I was essentially working against the limit of my mind, so I had to switch up my strategy to keep my job and my breakfast. It was time to write everything as fast as I could. And, well, it worked. I wrote quickly then went back and edited my word vomit so that it looked presentable. I figured if I really needed to, I could go back to my laptop and fix things. As it turned out I really needed to. Consistent, simple workflows are good because your mind can focus on the work, not how you're putting it together. In VR, that simplicity gets thrown out the window so you're putting a lot of brain power toward working in VR, which meant my work suffered. I could feel it with every piece. With every edit I received. With every headline working its way through my head. Things were off; I felt slower than usual. It was almost as if my mind was walking through molasses. Eventually I broke. Like the Benjamin Button of VR, my skills were regressing. However, I was still able to trudge through the slowness and get things done. It probably wasn't like my usual work, and they required many more edits than usual, but I put words to paper, so to speak. Working in VR might be valuable for careers where you need to play with 3D models, or if you're an artist or illustrator, but it's no replacement for the office. Not least is its solitary nature, but we don't yet have the tools to break through and make that interface smooth and intuitive. Until that time, I wouldn't recommend ditching the work office for a headset. Not if you want to keep your job.